Working in ‘Japow’ as a ski instructor. The best job in the world! Words by SnoworksGAP 2014 ski instructor Joe Cutler. Immediately after passing my BASI level 2 (British Association of Snowsports Instructors) I was in a plane heading to Niseko, Japan to work for ‘Go Snow’ ski school. 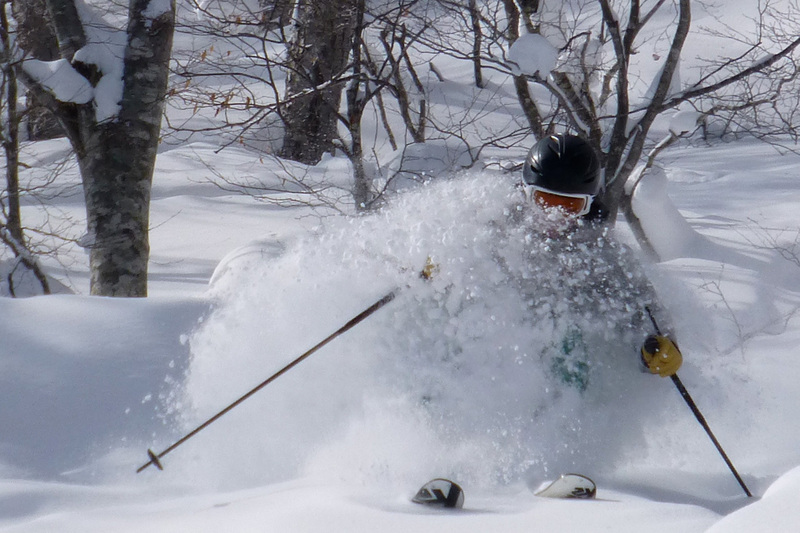 The skiing in Japan is famous for one thing, powder. This season has been a poor season and we’ve still had twice the snow fall of the Alps in a good year, it’s also worth mentioning the season here is short, December to February is when most of the snow falls. I was lucky to be offered several jobs in Japan and after some careful thought I choose ‘Go Snow’. They are based in Hirafu (the largest of the 4 Niseko resorts). Go Snow is a newly set up company based at the gondola in Hirafu (the main lift) and from the start gave me loads of work. Over Christmas we weren’t given a day off for two weeks and were working flat out, this was fun as we were expecting to have a quiet period in January, as it happened this quiet patch never came, by the time I took a day or so off a week I was still very busy and so it remained all season. This is not to say I got no time to ski, Niseko is open 12 hours a day! So not only does it have the best snow, some pretty epic terrain, you can ski it for longer than anywhere else. It snows so heavily when the heavens open that tracks are filled in within minutes. Some afternoons it snowed 6 inches an hour for 6 hours plus! This gave us incredible pow skiing, at night I would ski with some seriously talented guys who I worked alongside. When we weren’t skiing we lived in the main local town, approximately a 15 minute drive from work. The company put on a shuttle running about three times an hour from 7am until midnight, perfect for getting to and from work, and also return trips from nights out. The night life in Hirafu is good! Very Australian orientated and with some local Japanese restaurants. If you wanted a full Japanese experience the local bars in Kutchan were great fun, very few westerners and a lot of Nomi Hiday (a Japanese all you can drink deal). This always lead to many funny stories and “interesting” lessons the next day! The work I did was hugely varied, ‘Go Snow’ has two children’s programmes, adult group lessons and privates. All the instructors worked all of the programmes, meaning a lot of variety and teaching all levels of skiing. I cannot stress enough what a great time I had in Japan, it’s been hard but incredibly rewarding work. A massive thanks goes out to Lee and all the team at SnoworksGAP for helping me get qualified to BASI level 2 standard BEFORE CHRISTMAS thus allowing me to teach in Japan and enjoy and experience this fantastic job. I will be returning to SnoworksGAP in 2015 to train toward my BASI level 3 I.S.I.A and will also be returning to teach for ‘Go Snow’ in Niseko in winter season 2015/16.